Peruvian Paso Horse Resource - Pasos on the Web! Use the pull-down menu to pick a subject, then click PacaPaca to go there. Links will appear in this column, and when you click on them they will open in the window on the right. To open a link in a new window, just right-mouse click the link and select open in new frame or window. Advertising with Pasos on the Web! Conquerors! Book written by Deb Bennett! History of the Peruvian Horse by Adele von Rust McCormick, Ph.D.
History of the Peruvian Horse compiled from various articles written by noted authors. Great Horse Gifts! Horse Plush, Horse Chocolates, Breyer Horse Line, Toy Barns, and More! Dedicated to the Health, Well-Being and Performance of Horses through Veterinary Research, Education and Service; contains up-to-date information on equine health, research, and educational information; multiple-breed,internet-based, benefit Stallion Service Auction. Click on one of these following links to take you to the State or Country you are interested in. Specializing in strong, sound and naturally gaited horses. Our bloodlines include imported horses such as *Piloto, *Laurel, *FC Acierto, *FC Jalapeno, *Palomo. When in Arizona visit us in Yuma. Peruvian Paso breeders. Home of U.S. National and Canadian national best gaited horse, Palomo II. Home of North America's top living dam of champions, *Macarena. Horses and breedings for sale. Rancho Vista del Valle, LTD. Located North of Dade City, Florida is a small, private full care facility committed to the health and happiness of your horse. Close to excellent trail riding. 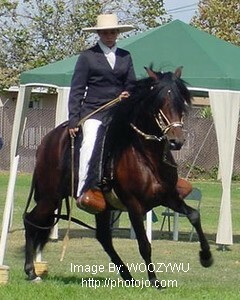 Top quality Peruvian Paso and Morgan Horses. Come experience the smooth natural gait of the Peruvian Paso Horse. Rancho Lario Peruvian Pasos is located in Marengo, IL and offers breeding, sales, training and horse locating. Individualized service. Quality training for trail and show. Champion bloodlines. Smooth as silk ride accompanied by beauty and wonderful temperament. We spend hundreds of hours on trails with our horses. Join us in our continuing mission to celebrate the magic of the Peruvian Paso horse! Breeders of Peruvian Paso horses. Homeof Lauredo breeding stallion HA Puritano at stud. Located in the beautiful high desert of central Oregon, we offer a full service facility for the Peruvian Horse and Rider. Breeding, training, horses for sale, tack, and clinics. Guided horse back tours in Oregon! We raise, show and breed beautiful and colorful Peruvian Pasos. Fillies and colts for sale. All babies imprinted and handled from birth and are very friendly. Standing RJS Kineno. The world's smoothest riding horse. High energy, strength, stamina, grace, beauty and excellent temperament. Great bloodlines. Breeding for luxury, comfort and strength, experience the smoothest riding horses in the world. This site is in Spanish! Tour Peru and the National Show with Cheryl Aldrich! A family business. I visited their booth at the Los Amigos show! Very nice! I met them at the Los Amigos show too. Also very nice! This is a link list of over 50 baby naming sites. If you have lots ot time, you may want to flip through. I like the "search names (by meaning)" box. It gives the origin of the name too. If you do not speak spanish, you can find a name that looks 'pretty' here, then use the Spanish English Dictionary (link below) to translate. If you have an English word that you want translated. This site has audio, so you can HEAR the word pronounced. I add and update information continuously. Please remember to refresh your browser.